Outdoors 720: Fishing trip, visit with President Carter is worth how much? Fishing trip, visit with President Carter is worth how much? 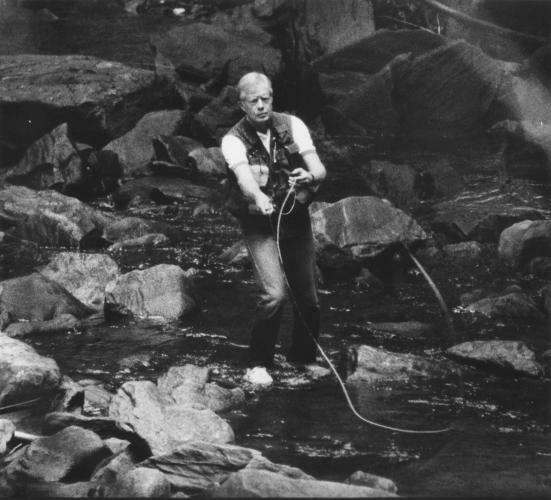 Article by Dave Strege first published as Fly-Fishing Fantasy: Bidder wins Trip and Visit with President Jimmy Carter on Technorati. How much would a fly-fishing trip that includes cocktails, dinner and lunch with President Jimmy Carter and wife Rosalynn be worth? That was the winning bid in a silent auction for a "Fly Fishing Fantasy" weekend at Brigadoon Lodge in the North Georgia mountains Oct. 14-15 (transportation not included). The annual auction featuring a variety of cool collectibles/trips benefits The Carter Center, an awesome organization doing great things throughout the world. Of course, if the bidder and his buds are purists when it comes to fly-fishing, they probably wouldn't want Carter along if he looked like he does in the above photo. Really, Mr. President, tennis shoes and Levi's while fly-fishing?